Nursing homes are supposed to be places where elderly people can receive the medical attention, living environment and social support that they need to live a meaningful life. Serious problems arise when nursing homes do not treat elderly people with dignity and instead abuse or neglect them. It is the job of family members to hold nursing homes accountable for this inhumane treatment and to seek help from New Hampshire nursing home lawyers when this happens. 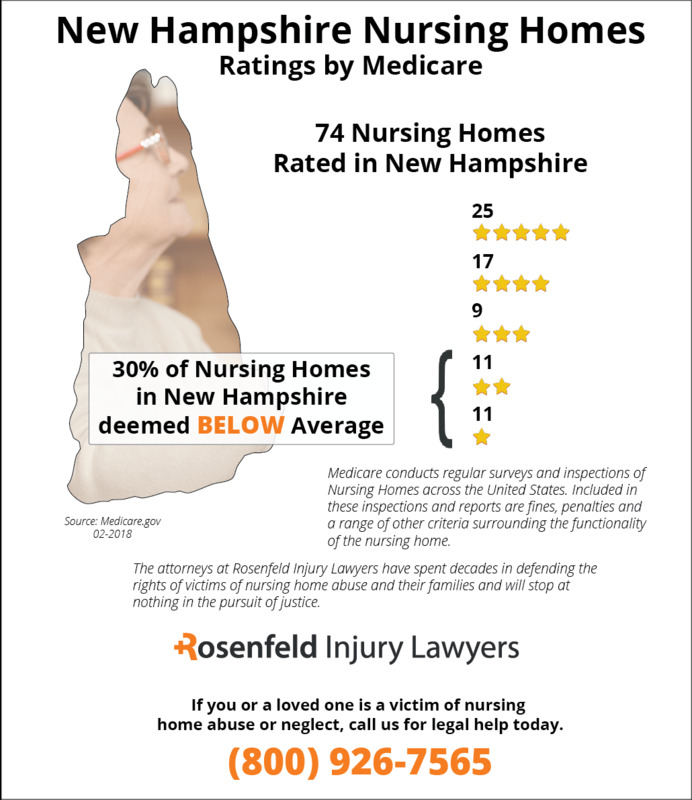 According to the latest data gathered by Medicare, there are currently seventy-four nursing homes rated in New Hampshire through inspections and surveys. The federal agency found that twenty-two (30%) of these New Hampshire nursing facilities had serious deficiencies and violations that led to residents being harmed or killed. Was your loved one abused, mistreated, injured or did they die unexpectedly through neglect while living at a nursing facility in New Hampshire? 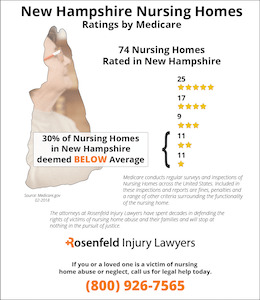 If so, we invite you to contact the New Hampshire nursing home abuse & nelgect lawyers at Nursing Home Law Center today to discuss a claim for compensation during a free case review. In New Hampshire, over 60 percent of nursing homes were cited in 2008 for having deficiencies in maintaining professional standards. Even worse, 31 percent of nursing homes experienced issues with food sanitation. Food may not have been properly prepared for residents or may have been spoiled in these facilities. Over 25 percent of New Hampshire nursing homes also have issues in providing comprehensive care plans for residents. These nursing homes are unable to develop care plans that adequately address all of the needs and services that residents require. 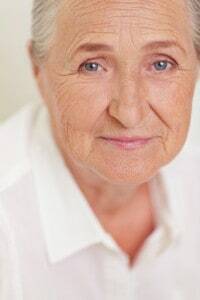 If you suspect that a loved one is being neglected or abuse, then you should speak with a New Hampshire nursing home lawyer today about a potential course of action. New Hampshire nursing home lawyers will see to it that the needs of your loved one are met and that administrators face the penalties. Nursing homes are required to operate under standards that are imposed by federal and state laws. For Medicare and Medicaid, there are reimbursement systems with strict guidelines that must be met. All too often, nursing home administrators attempt to get around these strict guidelines just so they can collect Medicaid or Medicare reimbursements from residents. They may not provide services like physical therapy that a resident should be receiving on a regular basis. They may not be providing adequate social activities to uphold the dignity of residents in the facility. These are a couple of ways in which nursing homes attempt to skirt around Medicaid provisions in such a manner as to constitute Medicaid fraud. Exploitation, abuse and neglect are some of the other legal terms used to describe the insufficient care provided by a nursing home. 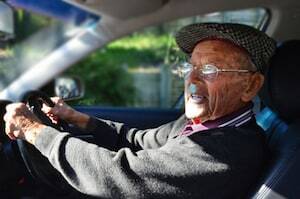 The laws which govern the care of elderly people in New Hampshire are the Ombudsman and Protective Services to Adults Act and the Adult Protection Program Act. Under these Acts, the ombudsman is required to maintain a reporting system that can be used for the filing of complaints. Anyone who makes a good faith complaint of abuse or neglect, apart from the person being accused of such behavior, is entitled to immunity under the acts. When adults are subject to being abused, neglected or exploited, they are provided with special protections under these laws. These laws ensure that they will have a safe place to go to escape such harm. A judge may enter an order that provides emergency placement of the vulnerable adult into a safer facility. If you notice any of these signs, then you should immediately file a report with the ombudsman of New Hampshire. A New Hampshire nursing home lawyer can also help you decide how to best proceed in the case. New Hampshire nursing home lawyers will help you to protect the rights of your loved one. Talk to a lawyer today to receive the help that you need. Usually, the only option a family has to maintain a loved one’s health is to move them into a nursing facility. Many families search for the best nursing facilities that provide the highest care given by highly experienced doctors, nurses and nurses’ aides. They choose the best nursing homes to ensure highly trained medical professionals will keep their loved one healthy. Families never expect that their loved one will acquire a bedsore (pressure sore; decubitus ulcer; pressure ulcer) while a resident at the facility. Unfortunately, pressure ulcers are a very common occurrence in nursing facilities in New Hampshire. Bedridden individuals and those bound to a wheelchair are highly susceptible because most are unable to reposition their body without assistance. The pressure of the body where it contacts the bed or chair can deprive oxygen to the skin and quickly cause a bedsore within hours. Without constant attention, repositioning and quality care, the skin can be deprived of oxygen and quickly start to die or be permanently damaged beyond its ability to fully heal. Nursing facilities are given the responsibility to protect the health of all patients by providing quality care. To eliminate the potential of a developing bedsore, the nursing staff must follow routine schedules to turn or readjust mobility-challenged patients. Each day, the nurses must assess the patient’s skin, head to toe, searching for any noticeable signs of a developing sore. When the sore is allowed to progress to advanced stages, the open wound can cause permanent damage and often expose tissue, muscle, bone and tendons. Without effective antibiotics, the patient can suffer life-threatening infection. Death caused by a bedsore is often imminent for patients suffering uncontrollable infections. Families are often outraged when notified that their loved one is suffering a bedsore acquired at the facility. This is because the pressure ulcer is likely the result of negligence by the medical staff responsible for providing quality healthcare. In addition to speaking to the administrator, families often review their loved one’s medical charts to look for any notations concerning skin inspections, prevention methods and treatments used once the bedsore was discovered. In addition, families will hire a New Hampshire nursing home negligence lawyer to take legal action to stop the neglect and seek financial recompense. If your loved one is suffering a pressure ulcer caused by neglect in the nursing home, it is crucial to fill out the contact form here to schedule an appointment with a professional listed below. The New Hampshire pressure sore attorneys can schedule a confidential no-cost consultation to stop the neglect now.